The rise of drug overdoses in New Hampshire has created a backlog of autopsies. 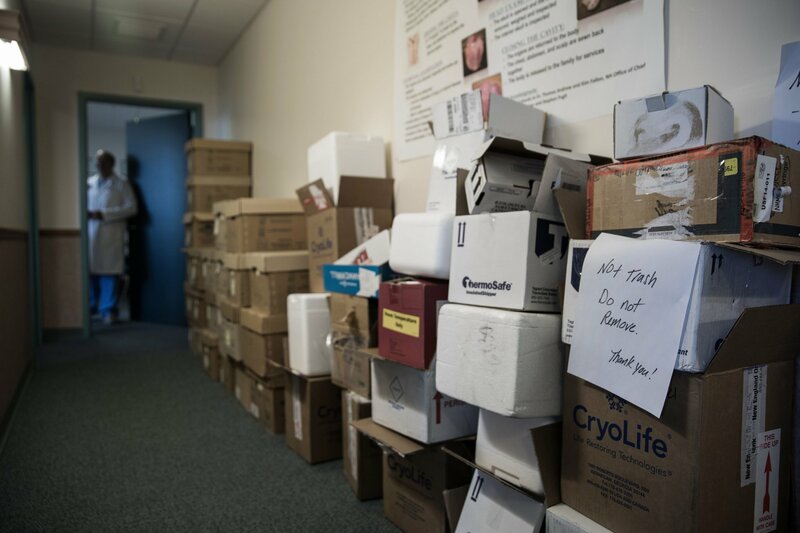 Files in the medical examiner’s office in Concord are piled up in the hallways. A medical examiner’s office is considered deficient if an individual pathologist must perform more than 250 autopsies per year. Last year, Dr. Andrew and Dr. Jennie V. Duval, the deputy chief medical examiner, performed 250 each. If this year’s number exceeds last year’s, New Hampshire could be in trouble. Pathologists cannot refuse to do autopsies just because they might risk losing accreditation. Nor would Dr. Andrew rush through them, he said, even if all signs pointed to a drug overdose. Since the overdose toll began to climb about six years ago, Dr. Andrew has pleaded for more pathologists. The legislature finally authorized one in July, but until then, his office had only two, the same number as when he started, in 1997. Upstairs from the morgue at Concord Hospital, in his cluttered office, Dr. Andrew pointed to a stack by his microscope of more than 80 folders containing glass slides of tissue samples taken during autopsies. Each folder represented an open case. He pulled out a logbook going back to 1997, when his handwritten entries began charting the earliest stages of what would become the drug epidemic. “There’s a blunt impact, a drowning, one drug overdose,” he said, scanning an early page. A few years on, he found seven overdoses on a single page. A more recent page: 12 overdoses. Most were caused by fentanyl, which by now has so thoroughly replaced heroin as the biggest killer on the streets here that the state no longer talks of a heroin epidemic but a fentanyl one. The logbook also revealed that drug users in their 20s and 30s are increasingly dying of heart-valve infections, known as endocarditis. The ages are young for such infections; in these cases, they result from dirty needles. So far this year, New Hampshire has had 41 suspected carfentanil deaths, 11 of them confirmed, far more than most states.